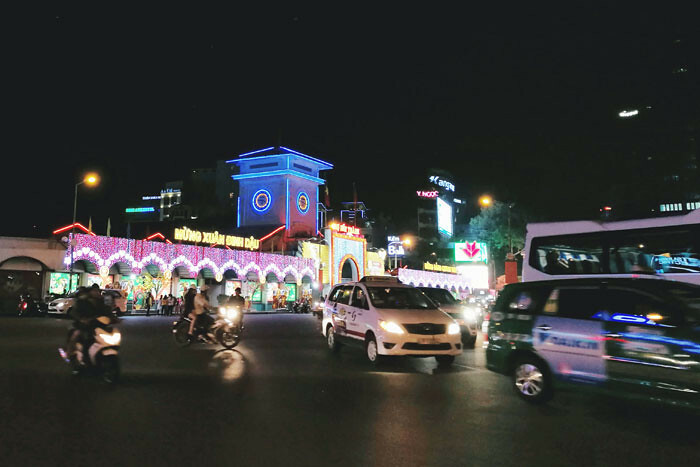 The last leg of our 9-day journey across 4 countries was in Ho Chi Minh, Vietnam. 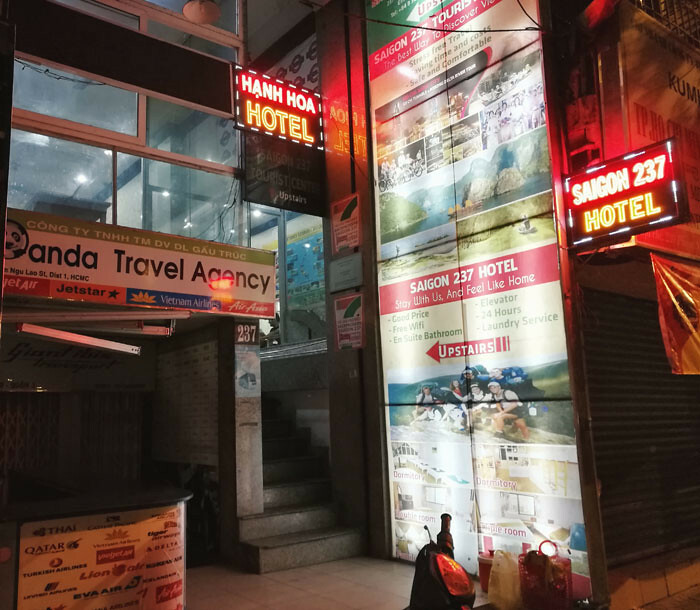 It was an exhausting 14-hour journey by bus from Siem Reap and our bodies were longing for a decent meal, nice, warm shower, and a comfy bed to rest our strained backs. LOL. 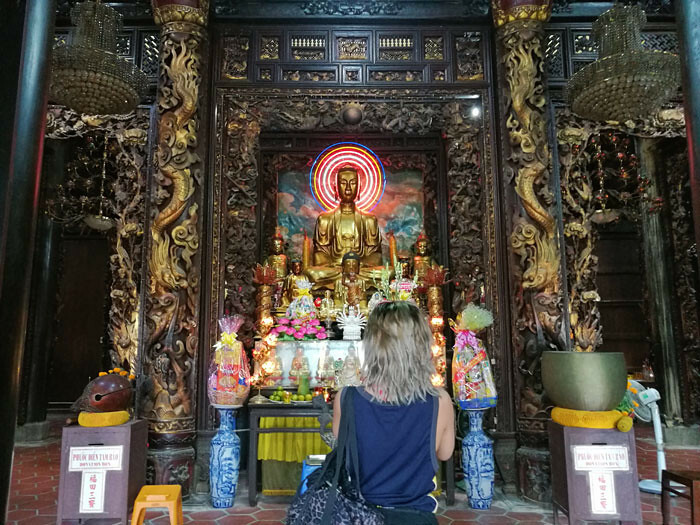 We spent 3-days in Ho Chi Minh coming from Siem Reap as part of our 9-day backpacking trip across Southeast Asia. It was the last leg of the trip so we made sure we were able to tour around the city and at the same time spend the remaining days to relax before we head back home to Manila. We were tired from all the traveling and arriving in Ho Chi Minh felt we were getting closer to home. The city felt very much like Metro Manila. Maybe it’s because of the number of motorcycles that you see on the road, or the dark, shabby streets or it can also be because the Vietnamese look very much like Filipinos. I still don’t know the answer now but in case you plan to visit Ho Chi Minh at least I know I can help you plan your itinerary. Outside the hostel, there are already a lot of travel agencies that can arrange your tours for you. The trick here is to talk to a few of them first and try to haggle for the best price. We got the Cu Chi tunnel tour for VND95,000 then we got the Mekong Delta tour for VND185,000. 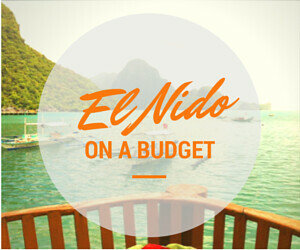 I think their published rates are way expensive anticipating that tourists will negotiate for a discounted price. We talked to 3 vendors until we finally booked the one that we liked best. 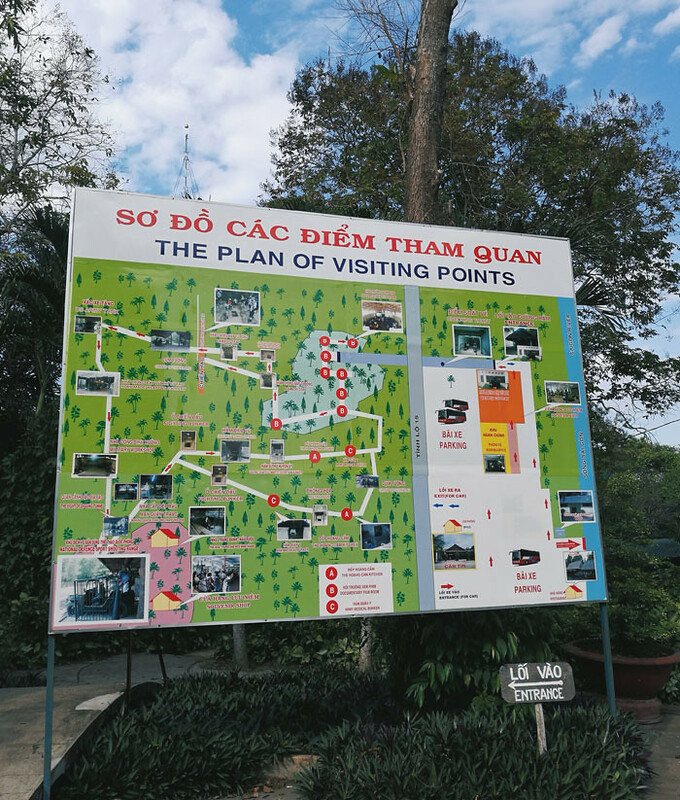 The Cu Chi Tunnel tour was quite an eye-opener for most of us because we didn’t know what the Vietnamese soldiers had to endure during the war. We came in unaware of the country’s rich history and it’s an understatement to say we were surprised of the Vietnamese people’s ingenuity. During the war, the Vietnamese had to create devices and traps for the enemies that were brilliantly hidden or disguised as something else. 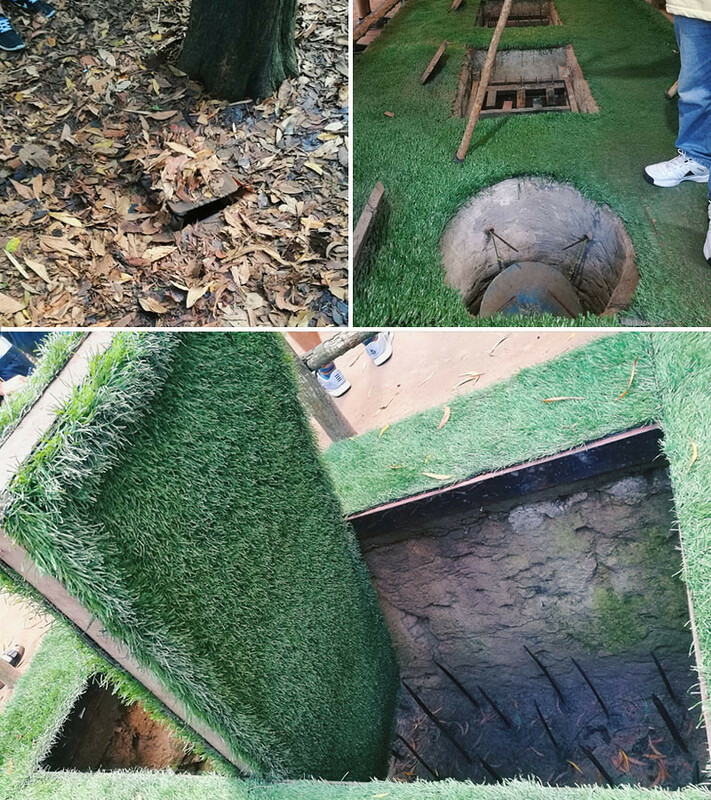 The tour to the Cu Chi Tunnel will include demos and display of these traps. There are tunnels and really sharp spikes that are hidden underground. Aside from these, they will also show you how the Vietnamese lived during the time of war, how they adapted to the circumstances and adjusted their lifestyles. Our Cu Chi Tunnel tour lasted 6 hours and the tour package came with free bottled waters and an English speaking tour guide. 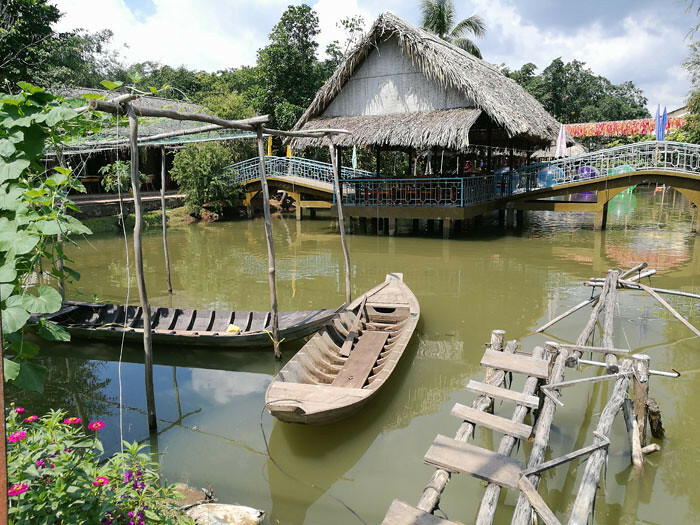 Vietnam’s Mekong Delta tour is a full-day tour to visit several communities along the Mekong River. There are a few islands and enclaves to visit on this tour and each will offer you a different experience. We met with the tour guide just outside our hostel then waited for the bus at a small shed beside a nearby road. The trip takes about 3 hours. The first stop was not at the main jump off point for the Mekong tour but it was at Vinh Trang Pagoda. Vinh Trang Pagoda is an ancient structure of mixed Chinese, Vietnamese and Khmer architectural styles found in Tien Giang province. 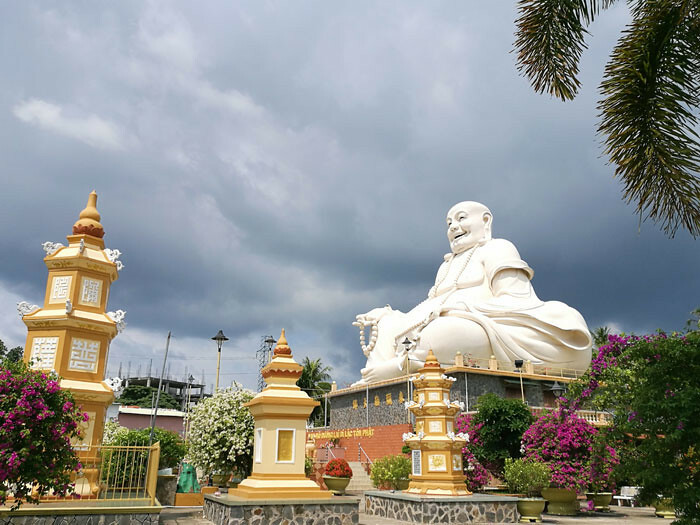 We stopped here to take photos and explore the various buildings of Vinh Trang. We finally arrived at the main terminal a few minutes away from Vinh Trang. From here we took a boat and started the Mekong Delta tour. 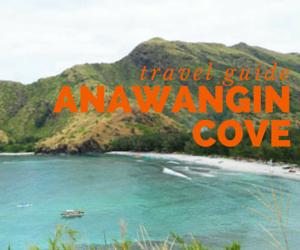 Our tour guide calls our stops as islands so here let me enumerate the highlights of the islands we visited. Learn how to make coconut candies and other products out of coconuts. There is an actual demo on how these are done. Other tourists were so amused that they bought several bags of coconut candies. Us, however, were not so thrilled since we have all of those products in the Philippines. If you feel more adventurous, you can ask your tour guide to let you take a sip of their famous their snake wine. Here is your chance to feed the crocodiles! The island has about 20-50 crocodiles on the den ranging from small to bigger ones. 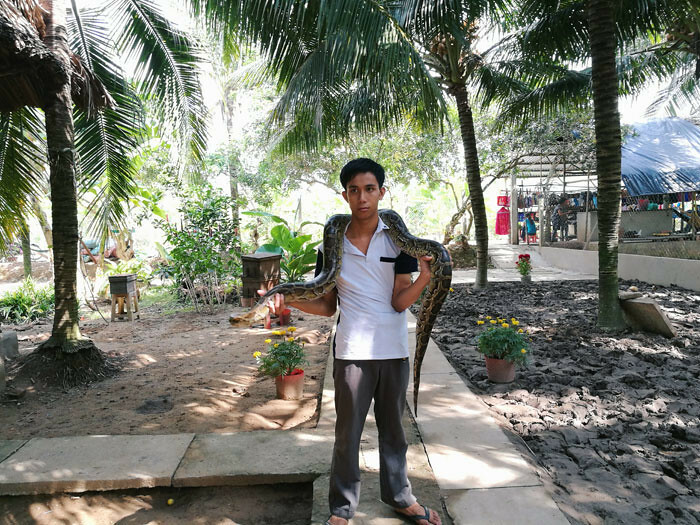 They are not, however huge like the ones we have in our Crocodile Farm in Puerto Princesa. Aside from feeding the crocodiles, you will also stay here for lunch and spend some more time to explore the island. Bicycles are free to use and hammocks are everywhere if you wish to take a nap or just relax. Hold a snake over your shoulders and lay your finger on a swarm of bees making honey. And I mean that you insert your finger on a wood amidst thousands of bees. After which you will be ushered to a free tasting of various products made from honey and some fresh fruits that are harvested in the same resort. While eating you will be serenaded by locals that are dressed in their traditional Vietnamese clothing called, Ao Dai. Products are also sold here if you wish to bring home with you some and the beautiful women wearing Ao Dai will also come over the tables for some tip after their performance. Get on a smaller boat and tour a part of the Mekong river while wearing the Vietnamese salakot. The highlight of the tour are the mangroves and the boat traffic. LOL. We went on a busy Sunday. There were a lot of tourists that went for a mangrove tour at the time and this resulted in traffic! I swear, Auntie, our guide had a difficult time maneuvering the boat when we literally bumped into other boats. 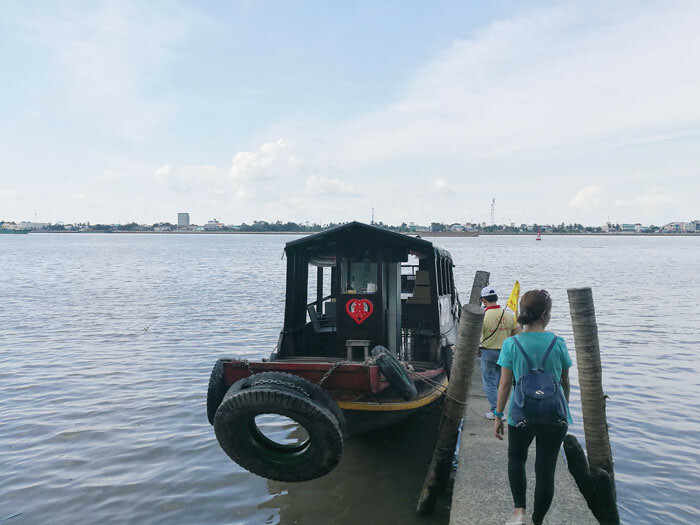 What’s a trip to Ho Chi Minh without a Mekong Delta tour? It looks so serene at first but towards the end there was a boat traffic. If there’s​ even such a thing. 😂 Auntie, our navigator had a hard time manuevering because boats were coming in everywhere. The tour included free bottled water and lunch at crocodile island. It also came with an English speaking tour guide which helped a lot because it became easier to understand what they have to say about a site’s background and story. This tour was highly recommended by a fellow Filipino that we met in Laos. We were told that a visit to Ho Chi Minh is incomplete without going on the Cu Chi Tunnel and Mekong Delta tours. If you plan to go, I suggest managing your expectations. If you are the type that prefers a cultural and immersive kind of tour then I think this is not for you. 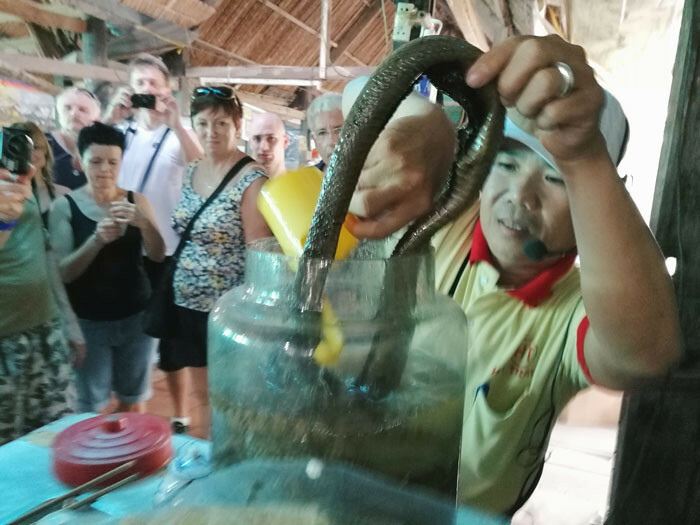 We were ushered into different areas of the Mekong river where we were entertained with how coconut candies and honey products are made then just before the tour ends, we are offered the same products to buy. The tour was designed too touristy for my taste. I recommend you book the Cu Chi Tunnel tour and leave out the Mekong Delta tour. 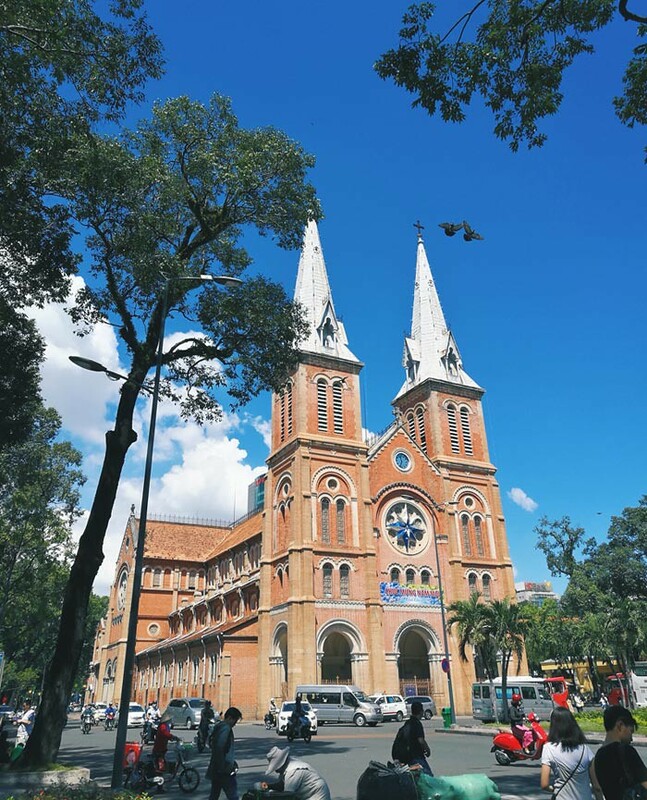 Visit the Notre Dame Cathedral, Saigon Central Post Office, City Museum, Opera House and other pagodas within the city by hiring a tuk-tuk or booking a city tour package with one of the tour agencies there. We did this DIY style and used this app – MAPS.ME. You can buy almost anything at Benh Thanh market. We haggled like crazy here, because we’ve observed that merchants are willing to sell their items at over 50% less than its original price. You simply have to walk away first then they run after you and ask for your buying price. The Vietnamese take their coffee seriously and I’m pretty sure it’s going to be easy to find a coffee shop while you’re in Ho Chi Minh. 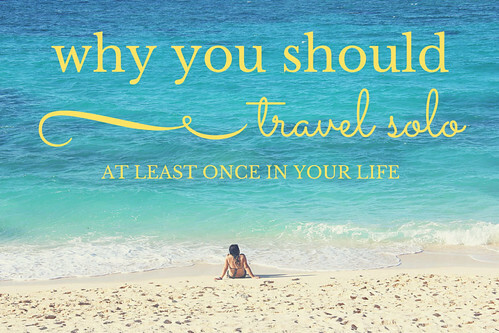 Because they are found literally, in almost every corner of Vietnam. What’s difficult is to find a coffee here that you wouldn’t like. It also doesn’t matter where you buy- it can be at a tiny makeshift store by the street or a fancy cafe, and both will taste awesome! One famous coffee shop in Vietnam is Highlands coffee but really, every single coffee I bought there in 3 days all tasted delish. TIP: Coffee packs are cheaper in convenience stores compared to their supermarkets. But if you can, scour the narrow alleyways and ask the smaller stores. It becomes more affordable there especially if you buy in bulk. Saigon 237 is conveniently located at Pham Ngu Lao Street near Benh Thanh and the Notre Dame Cathedral. The hotel receptionist and staff were all surprisingly young, like early twenties young. We were warmly welcomed and it felt like we were talking to old friends. The complimentary breakfast was an entirely different story. We were served toast, eggs, fruits, and our choice of coffee or tea. These were all self-serve except for the eggs and coffee. Our dorm room was made and the towels were consistently replaced with clean ones daily. This came as a bit of a surprise because not all hotels do the same thing when they are supposed to. We also just left our bags in the room and there was never a case of anything missing from our things. Though they have lockers to place your small important items like your wallets, passport, and other valuables though you will need to bring your own padlock and keys. Check the room availability on your travel dates here. Agoda also offers room discounts and coupons when you log in and create your account. If you like this post, please share by clicking on the social icons below.